Lyle Knight and Gary Wolkoff have been developing this area over the last two seasons. These two have been busy, because now there are over 130 routes at the Columns! 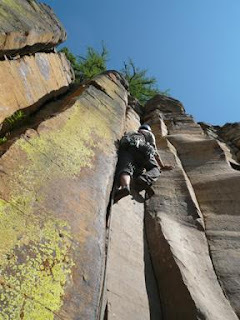 All ground-up ascents and all trad. Bring a full rack including wire brush and cord for tree stations. All information is in the Guide. Thanks for making this available Jordan, much appreciated. Sean D. has now also provided a download link on www.skaha.org, link above.